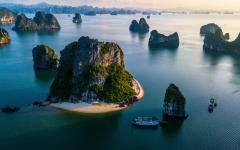 Situated outside of the cities, within the lush canopy of mountain jungles and in a bay with rising karsts and deep caves, you will find the natural beauty of Vietnam and Laos on this custom tailored tour. 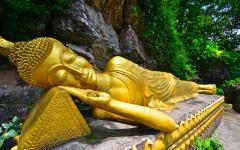 Waterfalls careen down the mountainside in lavish blue while caves are decorated with thousands of Buddha icons. Discover the magnificent wildlife, from charming birds to vivacious flowers, and the hill tribes that continue to cultivate the land far from the rush of city streets. You will explore the riverbanks and waterfalls, bays and caves finding nothing but splendor along the way. Off the beaten path of the city streets you will find the grandeur of the jungle and the blossoming limestone that stretches out of the emerald water. 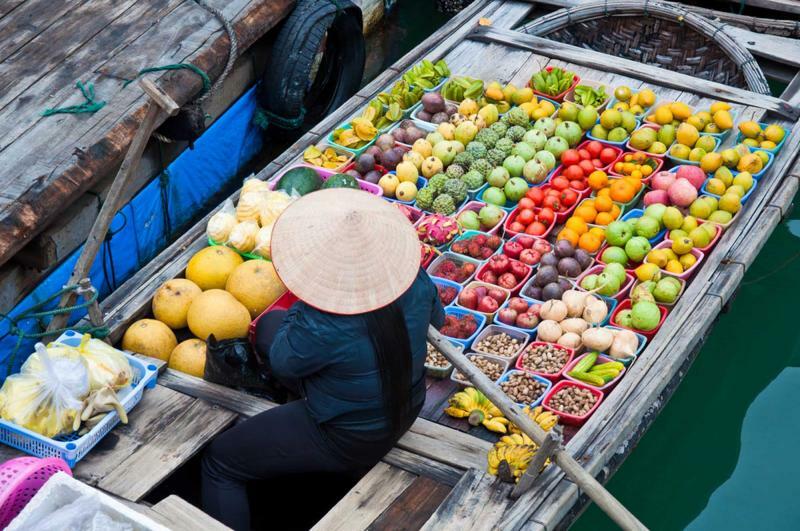 On this 12-day trip to Vietnam and Laos you will do more than visit Southeast Asia; you will experience it, from its vibrant culture and its unparalleled landscape set within the mountains that the French once used as resort homes, to the parading orange-robed monks that ask for alms each morning within the old Imperial Capital of Laos. From hidden caves to illustrious waterfalls you will discover the breathtaking beauty of Southeast Asia in its natural landscape and persistent culture. Your journey begins with your arrival in Ho Chi Minh City. 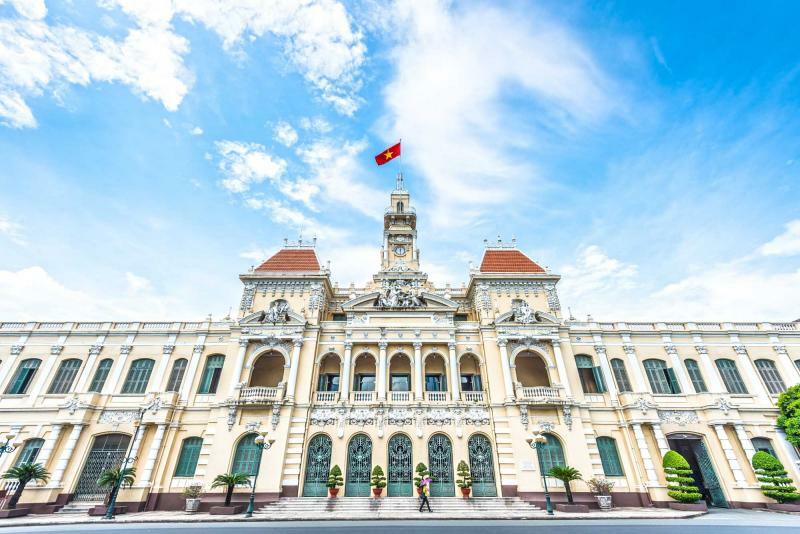 What was once the capital of South Vietnam is now the capital of Vietnamese commerce, bringing in the modern world on the banks of the Saigon River. Touring through the city brings you the contemporary history that remains a strong part of the collective neighborhoods’, and its people’s, identity. 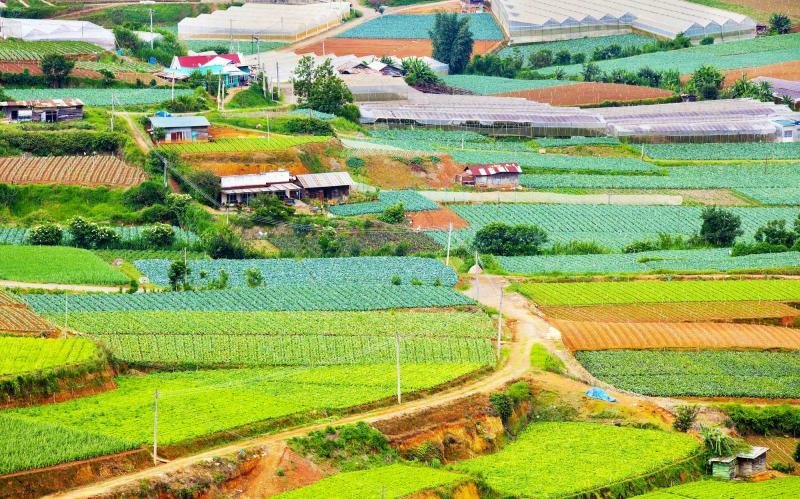 Venture through the city of Da Lat into the mountainside to spend two days within the stunning forestry that reaches along the undulating peaks, allowing the hill tribes to cultivate lavish crops, from coffee to artichoke, and even sensational flowers. 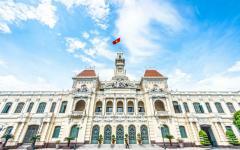 Once in Hanoi you will find a city that has been able to balance the energy of modern Vietnam with the soothing environment of culture, tradition, and nature. 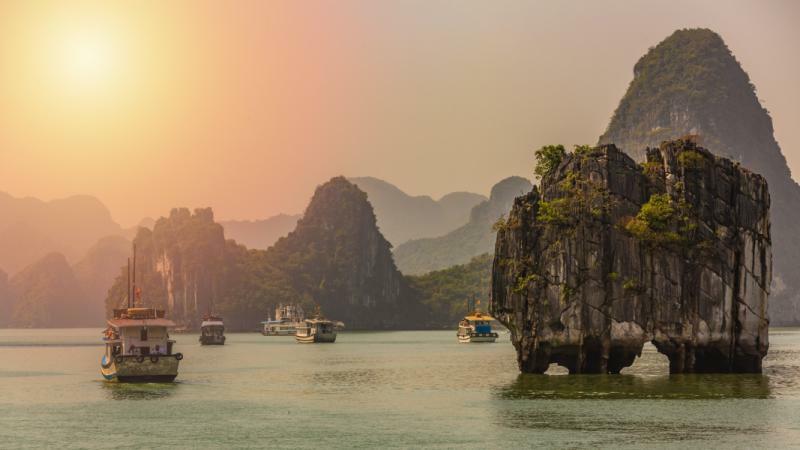 Spend the following two days cruising in luxury on the emerald waters of Ha Long Bay known for the exquisite limestone islands and towering karsts. 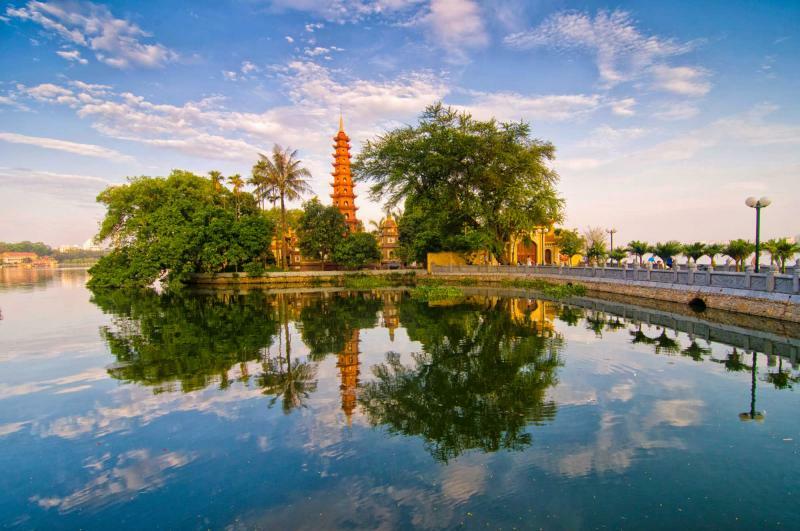 When you return to land you will indulge in the tranquil highlights of Hanoi once more before making your way to Vientiane, the capital of Laos. The serene streets of the capital bring almost a different world, combining French Colonial influence with a strong connection to history and tradition. 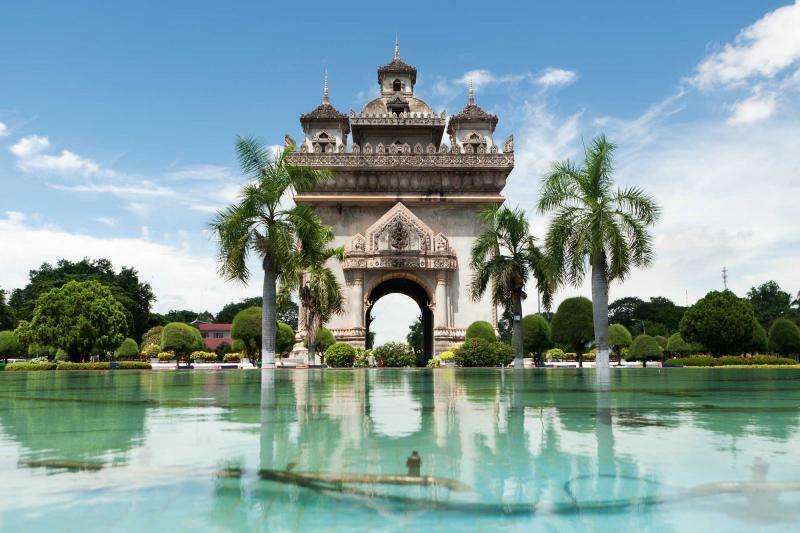 From Vientiane you will make your way to Luang Prabang, one of the most sensational and popular cities in the country, famous for its old imperial relics, tremendous forestry, and breathtaking landscape. Experience the monks’ morning procession before venturing to the Pak Ou Caves, dug deep within the limestone cliffs. 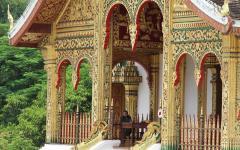 You will return to Vientiane before your trip home, allowing you to take in the charisma of the capital streets once more. 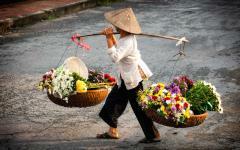 For more tour options, browse the travel packages to Vietnam and Laos tours. 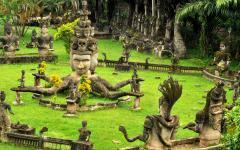 Also take a look at the reviews of Vietnam tours. 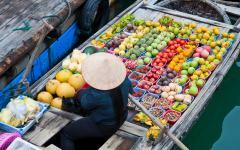 Welcome to the once southern capital of Vietnam, Ho Chi Minh City, where the streets are lively and the scents are enticing, from chili to garlic, ginger to coriander. You arrive at the airport and are met by your private transfer who will soon have you relaxing in the comforts of your hotel centrally located within the city. Vietnam’s center of commerce, the modern metropolis, wraps around the Saigon River bringing a vibrant skyline to the soothing waterway. 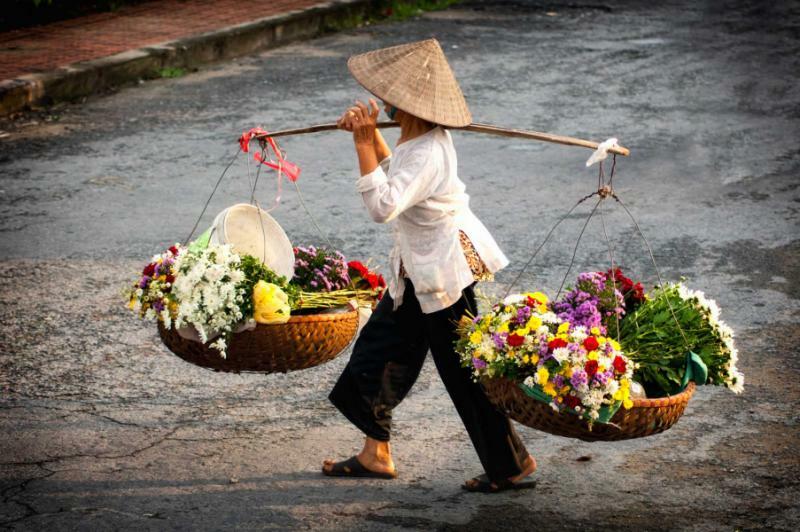 Through a blend of tradition, modernity, colonial history, and reunification, the wonder of Vietnam has begun. The morning brings back the pulsing energy that runs through the streets, filled with the modern bustle of bicycles running along the river’s edge carrying mounds of oranges, and motorbikes coursing through the city center. After breakfast, you will be met by your guide who will tour you through the cityscape which displays a diverse history, from ancient to contemporary. The Jade Emperor Pagoda was constructed in honor of Ngoc Hoang and continues to exude a specific atmosphere unique to the city, filled with phantasmal statues and gargantuan heroes. The reddish-pink exterior brims with brightness, almost like a welcome sign calling you to witness the grandeur within. You can see the elaborate tiling along the roof within the herbaceous scent of incense drifting through the temple. In the main gallery, you will find two imposing statues standing over 12 feet tall representing the generals that defeated key figures of legend, from the Green Dragon to the White Tiger. When hunger strikes you can follow the scent of the delicate spices that reside within the canary yellow French Colonial villa of Nha Hang Ngon. Sit in the courtyard where lights drift and sparkle around the open lily pond at the center. Enjoy an early breakfast around the time the energy of the city begins to stir. 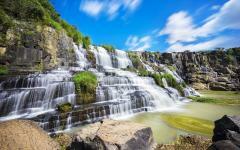 You will once again be met by your private transfer and taken to Da Lat for your excursion through the picturesque scenery that leads to the Tiger Falls trailhead. Along the path, the scent of pine trees washes over the air. The mountains are draped in pine forest, through which the trail runs. Step along the hanging wooden bridge that carries you over the ravine. The cool shade is a subtle change from the city’s skyline. Down along the Lang Bian River you hear the draping water before you see it. 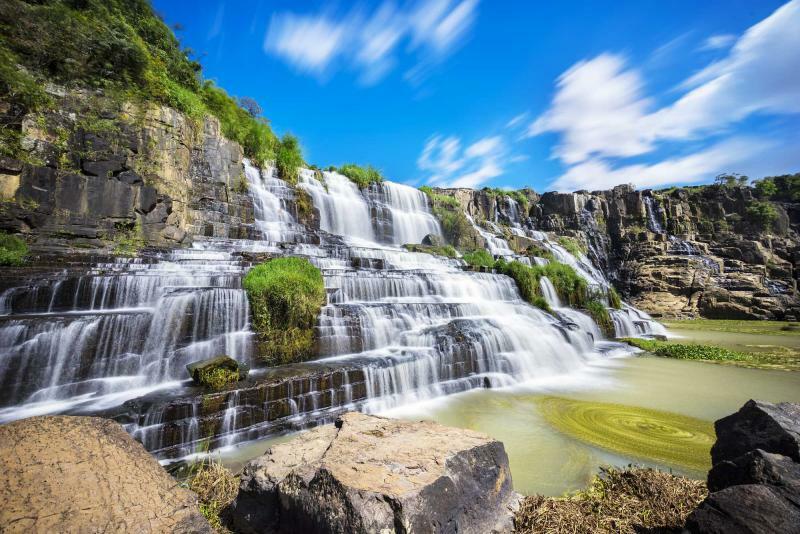 The tiered waterfall tumbles over the cliff side in a magnificent display of nature, bringing a curtain of water onto the rocks and causing rapids that settle in the river. The water is cold on your skin as you dip your fingers in, followed by your toes. 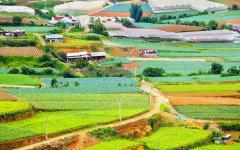 Continue your ascent up the mountainside that brings you to a remarkable view of the rolling slopes and valleys below. The greenery is lush and expansive, climbing and falling with the hills that rise over 4100 feet above sea level at their peak. In the distance you can see someone paragliding, sailing through the air on their way from the mountainous sky to the calm valley below. 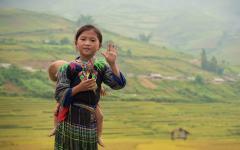 In the afternoon you will discover the hill tribes located within the high mountains, such as the Chil Hill Tribe. Located on a small coffee plantation where the fertile land helps them cultivate vegetables as well; the tribe must descend the hills for water where streams and falls abound. The villagers are curious and sincere, eager to show you their way of life which hasn’t changed for years, unobstructed and unannounced. The morning blankets the mountainside bringing the lush greenery of the landscape to life. 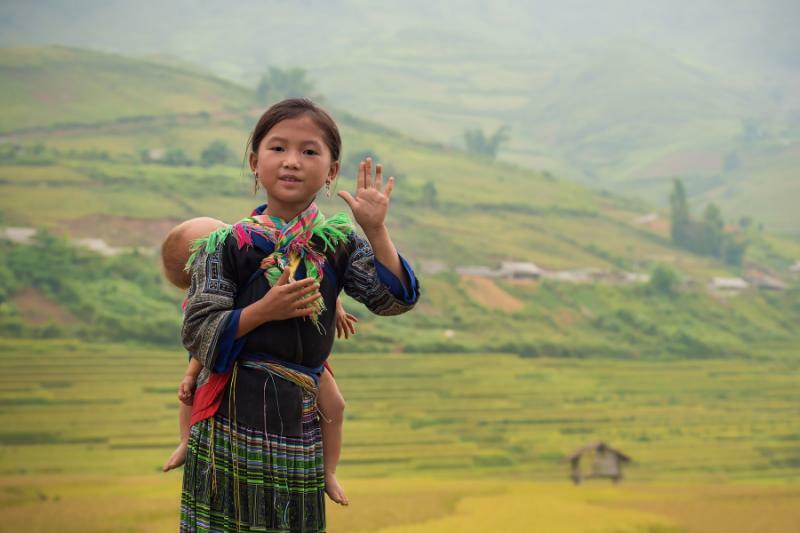 Before the scent of breakfast drifts through the air, you notice the terraced hillside that brings you to the quintessential image of Vietnam, where rice paddy fields add a particular texture and color to the scenery. The locals are once again inviting you to experience their daily life, from gardening to weaving, each detail important to their existence. The scent of pine returns as the trees begin to shape along the path once more. 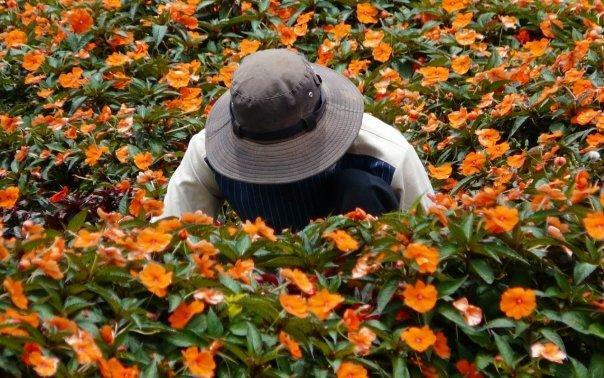 As you venture back to Da Lat you will come to Thai Phien Flower Village, a collection of greenhouses that bring color and life to the countryside through vegetables and flowers, and even fruit such as strawberries. 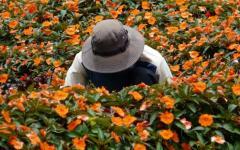 The traditional ward was created in the 1950s and continues to produce spectacular flora due to the rich land and abundant rainfall. The large greenhouses shine like rainbows, filled with budding poppies and local flora species that help cultivate a deeper connection with a flourishing culture. In the evening you settle in to comfort in the city of Da Lat. After breakfast you will be picked up by private transfer and taken to the airport for your flight to the unique capital of Vietnam, Hanoi. The beauty of the cityscape is how it has continued its connection to its elegant culture within the evolving modernity of the country’s larger cities. The skyscrapers are hidden within the lush trees that surround Hoan Kiem Lake, while the water’s gentle trickle around an old temple brings relaxation to the atmosphere balancing the energy of modern streets with the soothing ambiance of a remembered culture. You are met at the airport, and after a moment to settle into your central hotel, you will embark on a guided tour of the city. The Temple of Literature is a picturesque icon of the city, filled with both artistry and architecture and is the country’s oldest university, dating back to the 11th century. The wealth of literature and courtyards were once used by royalty and now represent a lavish and proud past. 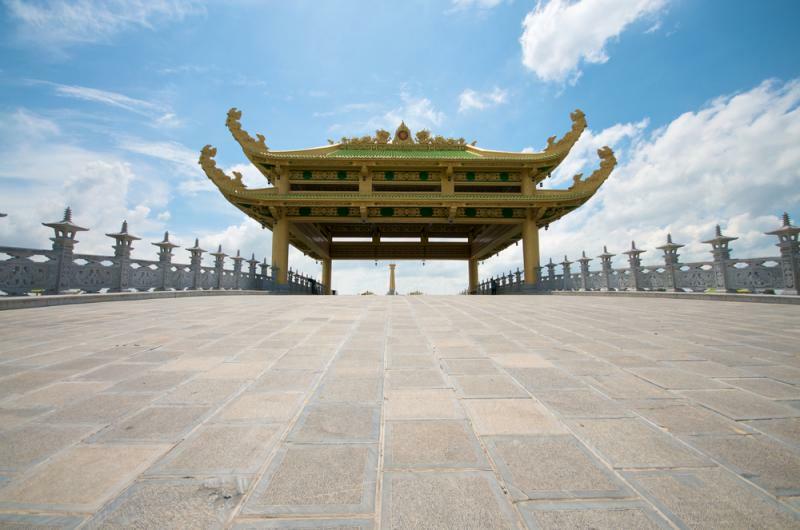 The organization of the area is based upon Confucius’ place of birth, where the main entrance illuminates the pathway once reserved for kings at its center. The scent of ancient trees brings about the comfortable ambiance away from the main streets of the city and bringing a touch of sacred history to you. The luscious aroma of breakfast is accompanied by the rich flavor of dark roast coffee and gives you a lavish energy to start your day. 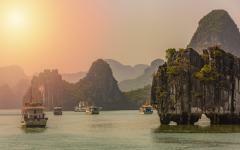 Outside of Hanoi you will come to the natural wonder of Vietnam near the Chinese border known as Ha Long Bay. 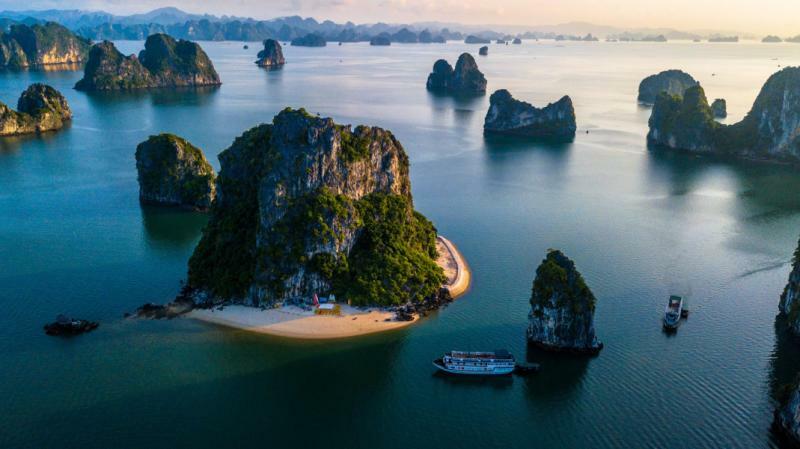 Decorated with over 1,6000 islands made of limestone that cover an area reaching over 930 square miles, it is hard to not immediately be impressed with the nature at work. You will board a fabulous Chinese Junk, known for its luxurious accommodation and iconic sails that look like fans draped over the ship, catching the breeze. Limestone karsts reach out of the water standing tall and proud, mixing marble hues with spotted jade above the glowing emerald water. Wake up to the surrounding beauty of the bay. The emerald water continues to shimmer in the early light while the aroma of morning coffee offers up its luscious, enjoyable flavor. The karsts sit in the distance as you come to the shores of Daugo Island. 125 feet above sea level you will find the Thien ung Grotto within Dau Go Cave, one of the largest grottoes in the bay, and filled with a variety of chambers that are adorned with stalactites and stalagmites. 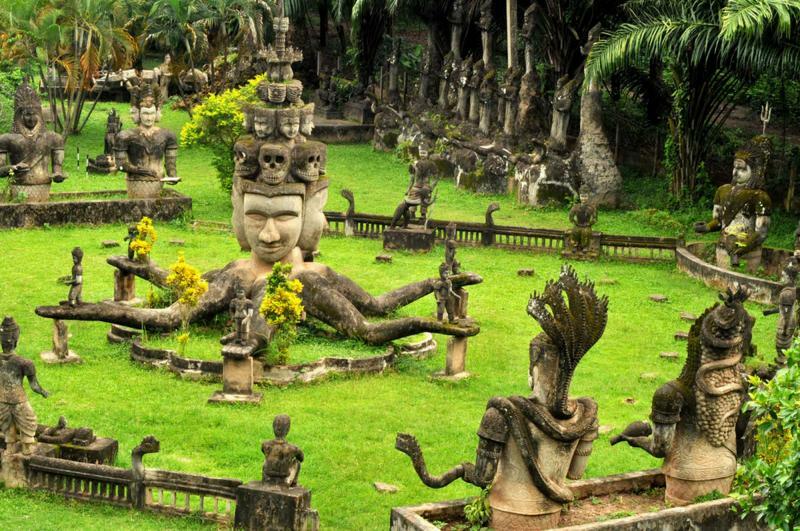 Among the rocks that look as though they melted from the ceiling or froze along the floor you will find the dynamic stories that have shaped the surrounding culture, brought from the legend of King Dragon that who formed the sensational enclosure. The rock is smooth and cool and the colors of the cave shift in the natural light that filters through. 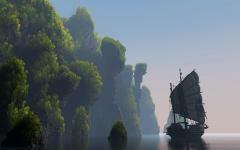 In the afternoon the ship will dock once more along the main shore where you will return to Hanoi for the evening. The day begins with the buzzing of the city streets coming to life once more. After breakfast you are taken to the airport to make your flight from the capital of Vietnam to the capital of Laos, Vientiane. Once you arrive you immediately notice the French Colonial influence of the cityscape. The scent of fresh baked pastries, the sweet sugary confections mixed with melted butter, drifts along the mid-morning air. 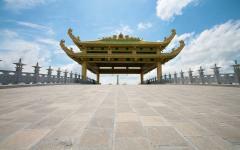 The streets are wide and spacious within the city center, giving way to the open plaza of Patuxai Gate, or Victory Gate. The monument began construction in the 1950s in dedication of those who fought for the liberation of Laos from the French. The interior is decorated with lavish depictions of Vishnu, Brahma, and Indra along the ceiling and the exterior contains five towers, each one a representation of the principles of coexistence. The view from the avenue brings the glistening platform of the musical fountains to foreground, and the towers rise above the plaza with the archway proudly at its center. In the evening you can delight in the flavors of Laos at Kualao, one of the most famous restaurants in Vientiane known for its quality of food, remarkable appearance, and central location. Whether you enjoy the bright flavor of papaya salad or the handmade Laotian sausage, the evening will settle in over the city with a calm luxury. The aroma of fresh brewed coffee and baked croissants is unmistakable and captivating within the tranquil streets of the capital city. 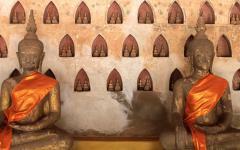 The sleepy charm of Vientiane is enjoyable but unique. 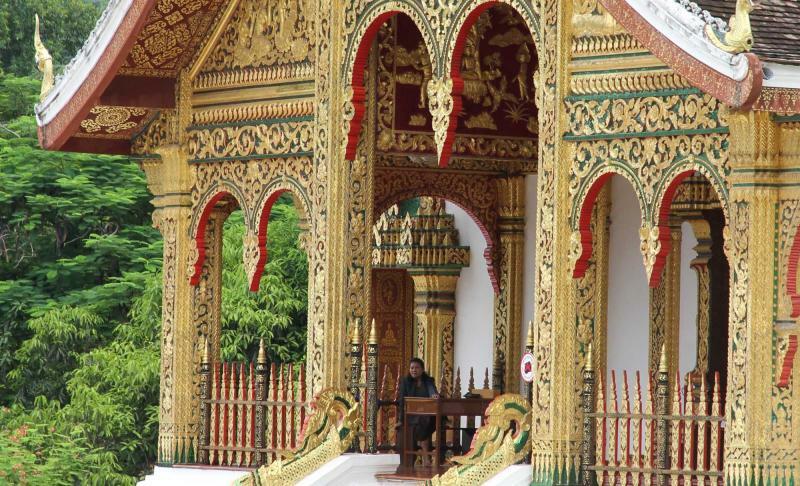 After breakfast, your guide and private transfer will meet you at your hotel ready to take you north to the bright colors and tranquil atmosphere of Luang Prabang. The ancient town is considered the heart of culture, rising over 2,100 feet above sea level and surrounded by mountains on all sides. The royal kingdom once sat within the city, using it as its capital and dating back to the 16th century. 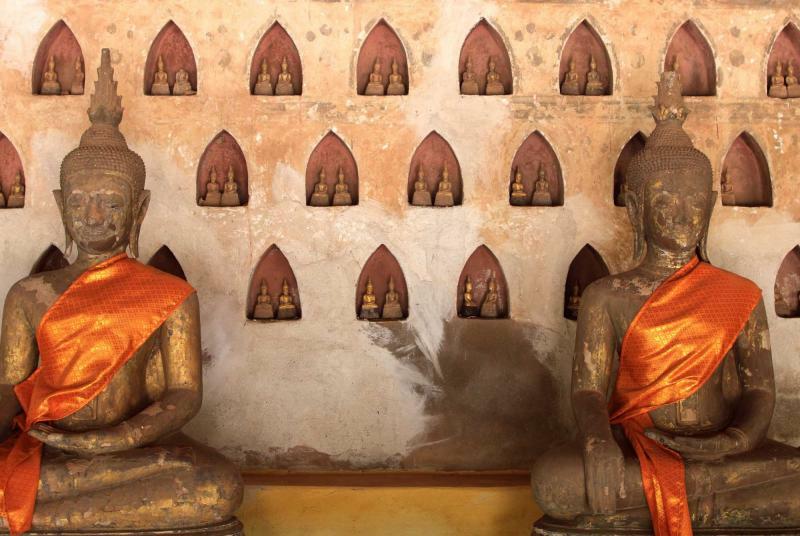 Within the historic neighborhoods, you can find over 33 temples within the city which is also the center of Buddhist learning for all of Laos, giving an ethereal ambiance to the tree-clad streets. 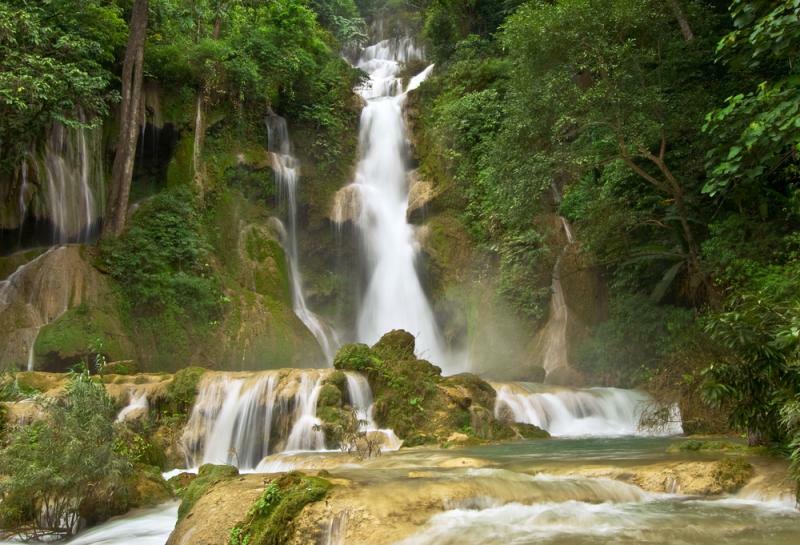 Just outside the city is the celebrated beauty of the Kuang Xi Waterfall, the largest near Luang Prabang. The water trundles over three terraces before dropping over 150 feet to the pool below. The water is refreshingly cold on your skin and luminescent blue in color. Whether you watch from above or below you can experience the breathtaking falls, from the cascading whitewater that gives mist to the canopy, or the calm streaming water that offers pools for people to jump into and enjoy the remainder of the afternoon. The morning mist covers the surrounding mountains within the cool early hours. You hear gentle bells tolling in the distance. Before breakfast you find a procession of monks walking through the streets as people stand beside the road, many on their knees, offering rice, money and cookies in their daily act of contributions to the monks. The monks’ orange robes seem to shine brighter as they offer prayer in exchange for alms. The mist dissipates with the sunlight, as do the monks. Soon you will venture out of the city and onto the Ou River where the remarkable landscape is filled with more than just natural magnificence. The calm water sits at the base of a limestone cliff towering over the riverbank. You see the open mouth of a cave as you come closer to the stairs that rise to greet it. 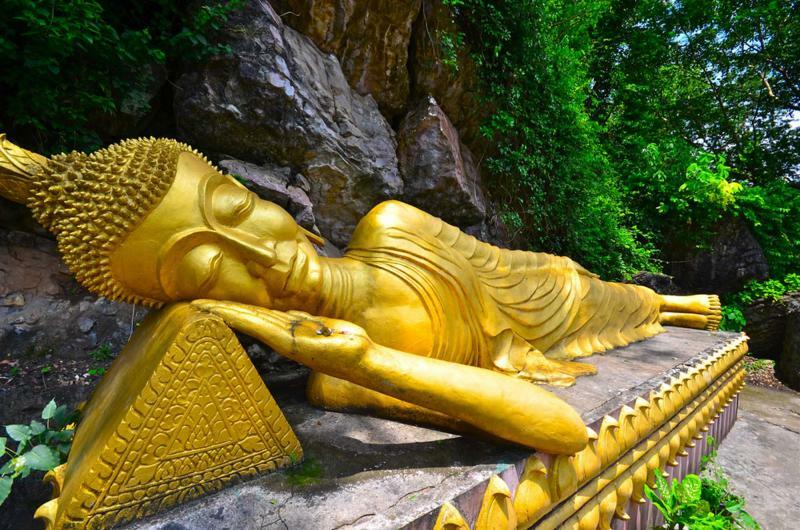 The Pak Ou Caves have a history that date back millennia, filled with thousands of Buddha icons within the dramatic cliff side. Rising around 50 feet above the water you can find the glistening figures of Buddha, mostly made from wood, blessing the cave and surrounded by limestone while incense filters through the scent of ancient earth. The morning brings another procession of monks through the streets as they are offered alms in exchange for prayers. The line of effervescent orange mirrors the coming sunlight. The morning is yours to luxuriate in, whether by venturing out to the Elephant Village Sanctuary or experiencing a traditional textile loom with a local family. For a great view of the city, you could venture up the 550 foot hill at the center of town known as Mount Phousi, home to a 72 foot golden stupa at the summit. The unparalleled view allows you to witness the city from all angles and in its entirety as well as the paint-like mountains in the distance. In the afternoon you will make your way back to Vientiane where the quiet comforts of the capital are once again there to enchant you. The Great Stupa of Vientiane is a sacred monument in Laos that has brought luster to its surroundings from its giant golden temple complex since the 16th century; it continues to catch the sunlight and glint in the open sky. On the fringes of the city, you can see the 148 foot tall golden tower in the distance almost like a beacon reminding you of all the beauty you have experienced while in Southeast Asia. Soon your private transfer will take you to the airport in time for your journey home; however, the splendor of Vietnam and Laos will never be far from your mind.